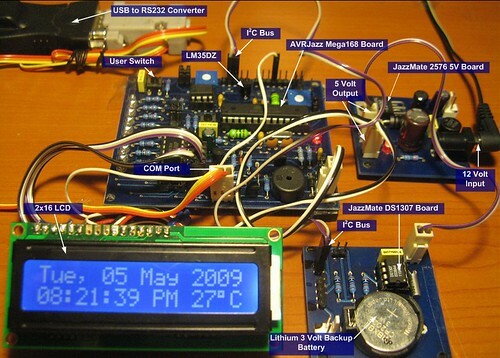 May 11, 2009 by rwb, under Microcontroller. Building our own digital clock is one of the dreamed project by most of the hobbyist or anyone that want to learn or involve seriously in the embedded system world; the ability to integrate time, day and date to the embedded system is one of the important knowledge that should be known by any embedded system designer. 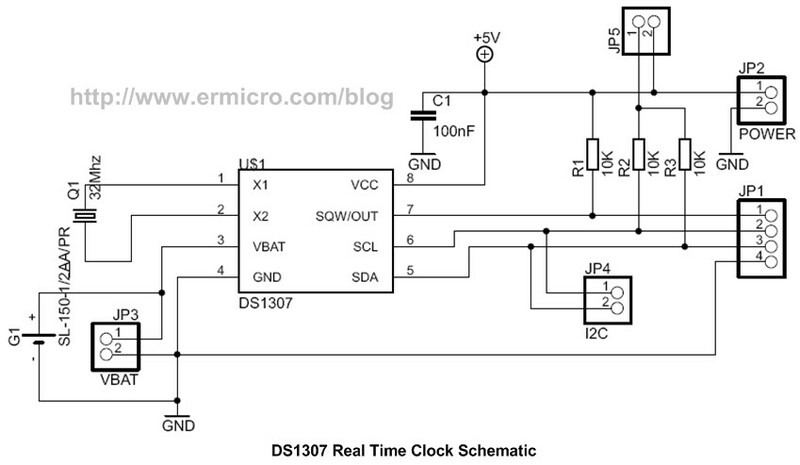 Today’s technology makes life easier as all these capabilities has already built nicely inside the Maxim (Dallas) DS1307 Real Time Clock (RTC) chip. The DS1307 is capable to count accurately the second, minute, hour, day of the week, date of the month, month and year include the leap year until the year 2100; with its I2C (read as I squared C, Inter-Integrated Circuit) interface capabilities make this chip easily to be integrated with widely available microcontroller that has build in I2C peripheral such as Atmel AVR Mega families or Microchip PIC18 families microcontrollers. Setup the clock using the UART (Universal Asynchronous Receive Transmit) to communicate with the Windows’s HyperTerminal application. The AVR ATMega168 microcontroller is used as the I2C’s master whiles the DS1307 RTC is used as the I2C slave that provide accurate date and time function. The TIMER0 peripheral inside ATMega168 microcontroller is used to read the DS1307 RTC register every 1 second and display the value to the 2×15 LCD. 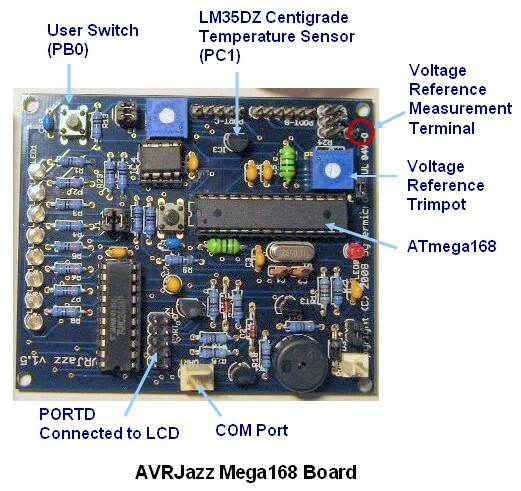 The build in national semiconductor LM35DZ precision centigrade temperature sensor on the AVRJazz Mega168 board is served as the room’s temperature sensor that will give 1 mv/oC output to the microcontroller’s ADC (Analog to Digital) input port (PC1). The 2×16 LCD display is operated in 4-bits data mode and connected to the ATMega168 PORTD (PD2, PD3, PD4, PD5, PD6 and PD7); the LCD backlight is controlled by the ATMega168 TIMER2 PWM (Pulse Width Modulation) port (PB3) through the Darlington transistor TIP120. 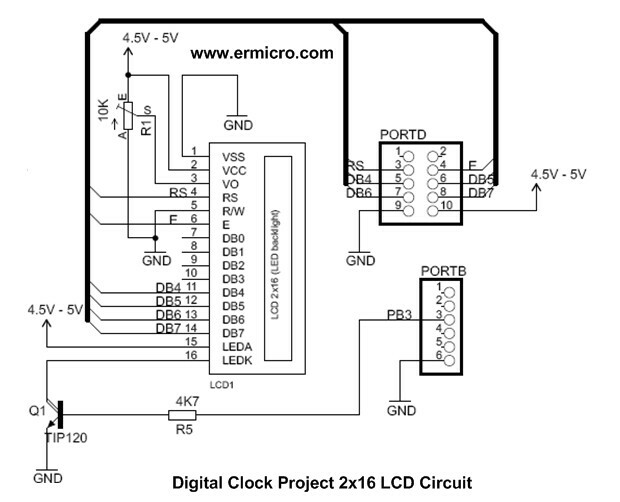 The PWM is used to dimming the LCD backlight while our digital clock is in the setup mode; entering digital clock setup mode could be done by pressing the build in user button switch attached to the PORTB (PB0). 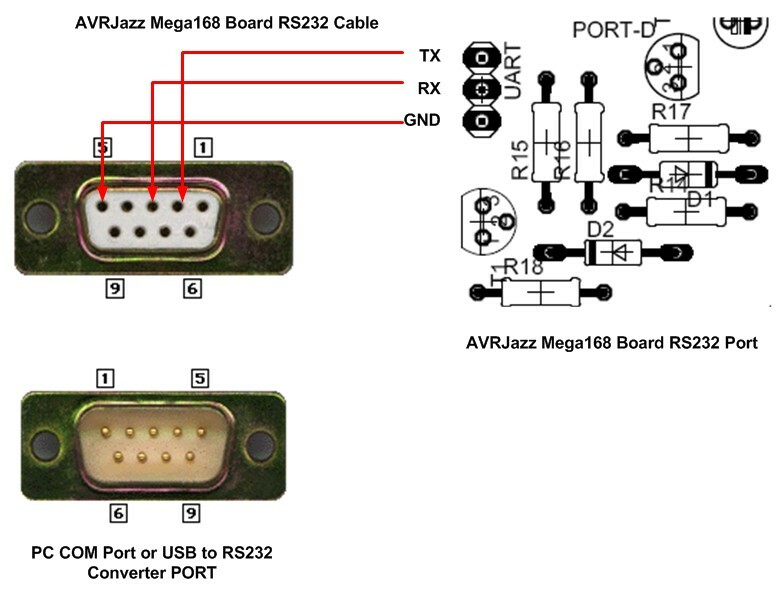 The last is the ATMega168 UART peripheral is used to setup our digital clock; using the AVRJazz Mega168 board build in RS323 voltage level converter; we could connect the RS232 communication (COM) port directly to the computer COM port or you could use the USB to RS232 converter as I did and use the MS Windows HyperTerminal program to enter our digital clock setup. // DS1307 automatically will increase the Address. Clocked by 32.768 kHz crystal; the Maxim DS1307 is one of the popular I2C 8-pins RTC chip available on the market; other quite similar product is the Philips PCF8583 I2C 8-pins RTC chip which has additional programmable alarm, timer/counter and interrupt functions beside the standard time and date function. On this project we will focus on the Maxim DS1307 Real Time Clock chip but the principal we learn here could be applied to the Philips PCF8583 RTC chip as well. Equipped with Automatic Power-Fail Detect and Switch Circuitry the Maxim DS1307 will continue to operate accurately even though the main power supply is lost and because it’s consumed less than 500nA on 3 volt lithium backup battery (48mAhr or greater), the DS1307 will continue to operate more 10 year in the absence of the main power supply (for more information please refers to the Maxim DS1307 datasheet). The Maxim DS1307 RTC timekeeper registers start in address 0x00 to 0x06 and its stored the time and date value in Binary Code Decimal (BCD) format; it have one control register located in address 0x07 and 58 byte battery-backed nonvolatile (NV) RAM located in address 0x08 to 0x3F; this RAM could be used to store information such as the digital clock alarm setting or simple event reminder. 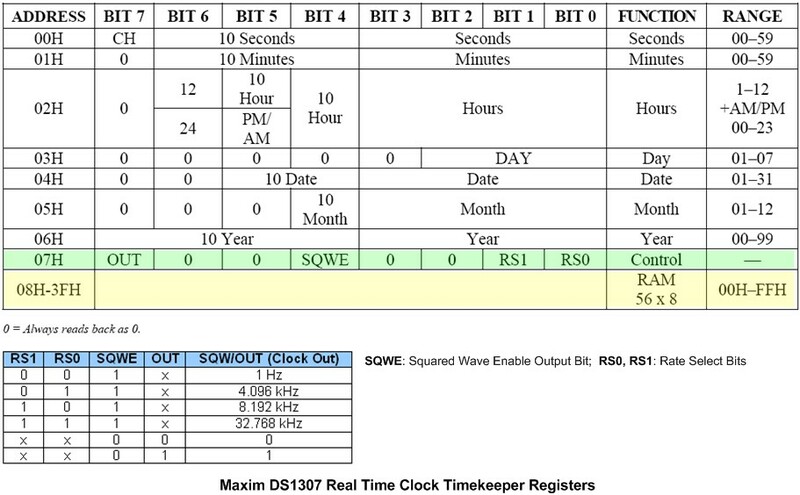 The DS1307 control register is used to enable or disable the square wave output on pin 7 (SQW/OUT); the frequency could be selected by setting the rate selection bits RS0 and RS1 and to enable the square wave output, simply set the SQWE bit to “1“. The SQW/OUT pin is an open collector output which required a pull up resistor in order to operate; you could use the square wave output to pulse your microcontroller project or other peripheral that needs it. As I mention before the DS 1307 timekeeper registers store the value in BCD format; this type of format is different compared to the normal binary value, for example the number 38 could be represent in binary value as 0010 0110 or 0x26 in hex notation but in binary code decimal format the number 38 is represented as 0011 1000. The BCD format stores every decimal digit start from least significant digit (LSD) ( decimal 8 ) to most significant digit (MSD) (decimal 3) in four bits forms known as nibble, where each nibbles represent the decimal number 0 to 9. 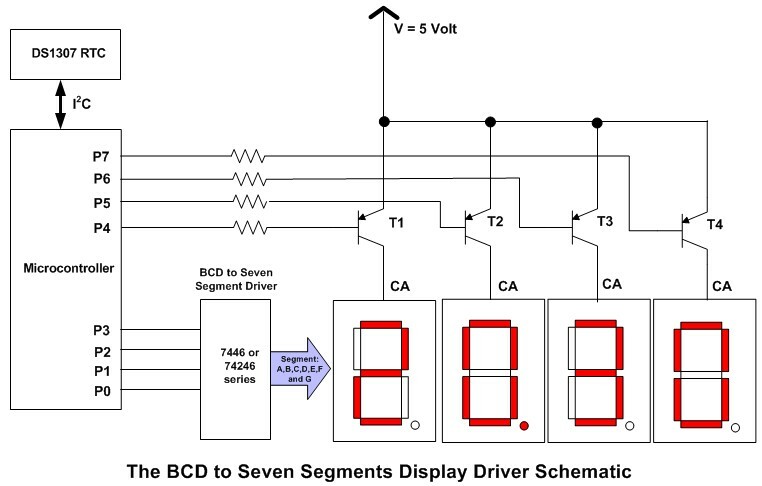 Since in this project we use 2×16 LCD and HyperTerminal instead of the seven segments to display the time and date, therefore we have to convert the retrieved data from BCD to DECIMAL before we can use it; and convert the configuration data from DECIMAL to BCD before we store a new initial value to the DS1307 timekeeper registers. The clock halt bit (CH) in registers address 0x00 is used to stop the DS1307 internal oscillator when we set it to “1“; for example, we could use this feature to timed the time elapse event; but in this project we always set the CH bit to “0“. As said on the DS1307 datasheet, because the initial power-on state of this bit is not defined, it’s important to enable the internal oscillator bit (CH = 0) during the initial configuration. The DS1307 RTC acts as an I2C slave device and communicate to the AVR ATMega168 I2C master controller though the I2C bus. As standard to all I2C devices; the DS1307 RTC has an unique 7 bits address consists of 4 bits device identification and 3 bits device physical address; the first 4 bits for this device identification is “1101” and the last 3 bits of physical address is always set to “000“, which mean we only can attached one DS1307 device on the same I2C bus. This operation mode is used when we want to store the data into the DS1307 registers such as setting the time and date or store data to the DS1307 nonvolatile RAM register. After sending the I2C start condition and select the DS1307 device from I2C bus (sending ID and address), we set the DS1307 register pointer by sending the slave register address (e.g. 0x00 the first timekeeper register address). After the DS1307 send acknowledge than we could continue to send the data and the DS1307 will response with acknowledge and automatically increment the pointer register. We could continue send the data until all the data being written to the DS1307 timekeeper registers (address 0x00 to 0x06) finally we send the I2C stop condition. The same principal we could use to store data to the DS1307 RAM; instead of starting with the timekeeper register in address 0x00, for the nonvolatile RAM we could start in address 0x08, this will set the DS1307 pointer register to 0x08. This operation mode is used when we want to read the data from the DS1307 registers such as time and date or read data from the DS1307 nonvolatile RAM register. The data read operation is start by setting the DS1307 register pointer in address 0x00 using the write operation after sending the stop condition; then we continues to send I2C restart condition and again select the DS1307 ID with read instruction and follow by continuing reading all the DS1307 timekeeper registers (address 0x00 to 0x06). Each time the data is successfully read the master will send acknowledge (ACK) and the DS1307 will automatically increment the pointer register and continue to send the data stored in the pointed register until the master send the no-acknowledge (NACK); which tell the DS1307 to stop sending the data. Finally we send the stop condition to release the DS1307 device from the I2C bus. The program start by initializing the ATmega168 ports used and we continue with the LCD device initiation, UART peripheral, TWI (two wire interfaces) peripherals (Atmel implementation of I2C protocol), ADC peripheral, PWM (Timer/Counter2) peripheral and the last is the TIMER0 peripheral. Most of the functions used in this project are based on my previous posted blogs mention above with some additional and minor modification especially for the I2C functions. num2str() function is used to convert a numeric value to a string, we use this function to display numeric value on the LCD. i2c_transmit() function is used to transmit data to the I2C devices and wait for transmission done by monitoring the interrupt flag bit (TWINT) to be set. i2c_read() function is used to read data from the I2C slave device register; the I2C master read operation could be selected to response with ACK (acknowledge) or NACK (no-acknowledge); this feature is used in the multiple data reading as in the DS1307 RTC. This mean the ISR(TIMER0_OVF_vect) or TIMER0 interrupt service register function will be called every 10ms; and every time its being called; the function will increase its static internal variable by one (tenms). When tenms variable reach 100 (means every 1 second); than we read the DS1307 timekeeper registers as well as the LM35DZ temperature sensor and display the data on the LCD. The getnumber() function is used to validate the user input; this function used the standard I/O C function scanf() to read the user input from the HyperTerminal application. One of the important used of the time and date integration in the embedded system is to provide the time and date stamp to the required information such as time attendance machine, automatic parking ticket, remote data logger, event elapse time and many more. By combining the I2C EEPROM and I2C RTC devices you could start build your own time and date stamped data logger; perhaps to answer a simple question such as when is the hottest temperature during this year; knowing this fact maybe make us more concern to the global warming issue that we are all facing today. this is fantastic..I like to develop this project but I need to used the pic 16F877A and code prgramme C language that compile using PIC C compiler..how I should troubleshoot the schematic and programme? 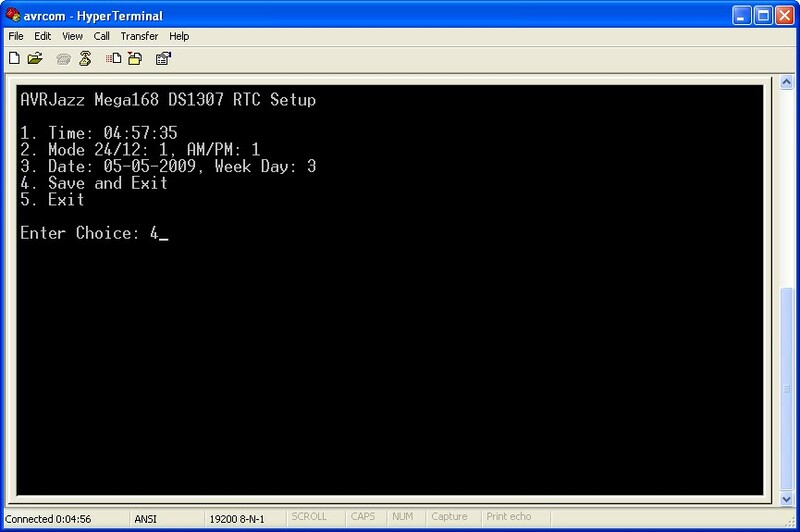 On the contrary; for the beginner programmer its easier to use the serial terminal instead of buttons, since using the buttons means you have to do special display menu in LCD and buttons to set both date and time. The DS1307 doesn’t support the summertime compensation. And do you give me some instruction, how to set the time with pushbuttons? A good example is the digital watch and the bed clock/alarm. Usually they have at least two buttons, the first button is used to choose the clock setup function e.g. hour, minute, and second. The second button is used to set the clock digit (increment). The same principle could be used for setting the date. You set the TWBR register at 0x30 about 11 Mhz, but my mcu work with 16 Mhz in this case what is the value of TWBR? Thank you,i calculated the value of TWBR and i think it the good value for the 16 Mhz is 0x43. Is there anything else you need to change because of the 16 Mhz? You could try that value and for the I2C bus; that’s all you need. I booted your C code to my Atmel 328P…that is OK,but 6 secounds period stop for about 2 secounds and then start again,and the temperature value is only 99’C! Do you know, what is the problem? There are many factor when the program didn’t work, therefore you need to break it one by one. First make sure all the hardware work properly e.g. I/O port, temperature sensor, RS232, and RTC chip. 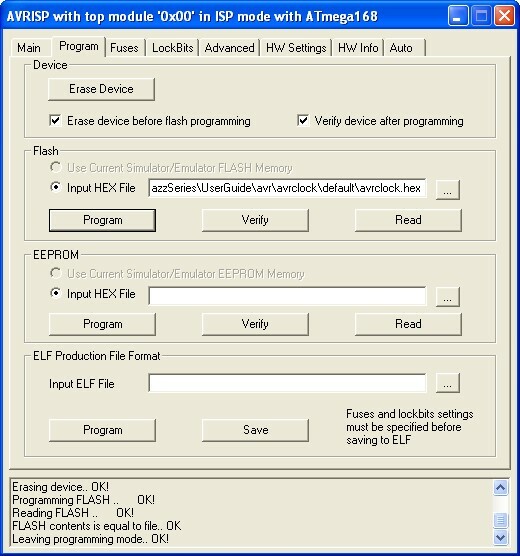 Next debug your program on each microcontroller peripherals e.g. I/O, UART, ADC, and I2C. Very nice toturial, but i have a question. The slave address of the DS1307 is not 0x68? Yes is not 0x68, because the DS1307 slave address byte contains the 7-bit (i.e. 1101000) followed by the direction bit read (1) or write (0), therefore the complete DS1307 slave address for reading is 11010001 (0xD1) or writing is 11010000 (0xD0). Dear sir,thank you very much for this wonderful tutorial.it has really assisted me in my final year project i am doing now.i am using atmel xmega256a3 and DS32B35 RTC.So your tutorial actually addresed some of my problems.thank you for taking part of your time to produce this tutorial. Sir i need your guide on how to copy the content of an array to a pointer.In order to display the content of RTC to the touchscreen LCD im using,I need to send this command(12,1,53)%256 to Lcd.below are my codes but it was not giving me the desired result when i ran it.i have very little experience in C programming and i will be very glad if you could put me through. what i intend to achieve with the above code is to copy the content of my array SendCommand into the pointer *ActualData. Sir i would be very glad if you could be of help.Once again thank you for this tutorial. To get the pointer variable actual data on C language we use the “*” sign. By incrementing the pointer address, you could get the next array data. I suggest to read a good C language book such as “The C Programming Language” by Brian W.Kernighan and Dennis M.Ritchie for more information. thank you for your quick and detailed explanation.i really appreciate your kind gesutre.i will do just as you adviced.best regards. Re avrclock. I tried AVR studio 4 and the hex file simulated in Proteus ISIS, but the results in the virtual terminal is garbage. Also the screen of the LCD always displays- SET-UP MODE. Is there any difference using the Atmega 168 development board and using the Proteus ISIS ( with same schematic as the Atmega 168 development board)? I also tried your tutorial in RS232, same thing happened, Vitual terminal in Proteus ISIS simulator is garbage. I followed the correct baud rate and CPU clock speed. Virtual terminal is a direct TTL level that can be connected directly to Tx/Rx pin of the microcontroller. Where could be wrong? Would appreciate your kind assistance. 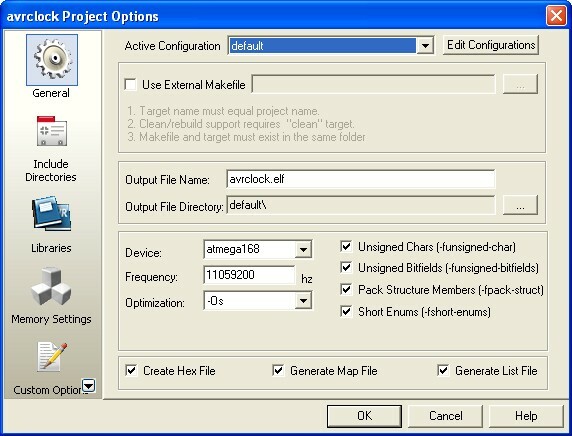 I’ve never simulate all the project in this blog on Proteus ISIS software because I prefer to program directly the Microcontroller hardware rather than simulate it on the Proteus ISIS software, therefore I suggest to ask directly this issue on their forum. 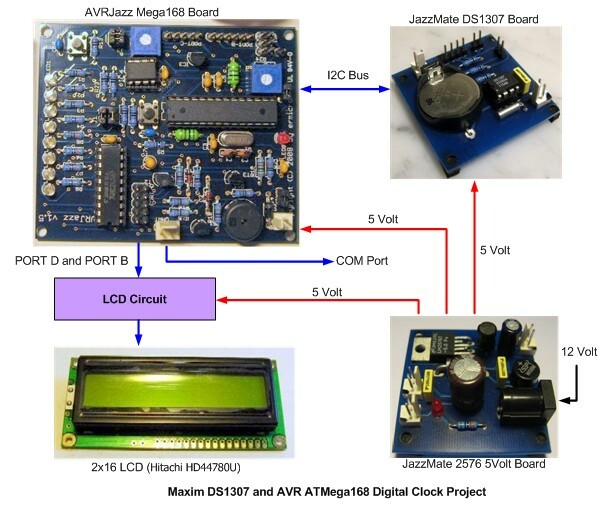 Anyway the AVRJazz Mega168 development board use 11059200 Hz crystal resonator. Basically if the virtual terminal give you garbage, mean the clock and the baud rate is not set correctly. 1. AVRclock. No clock display in the LCD. Also, no display of temperature. 2. RS232. Screen keeps on scrolling-up when I enter a guess number. This is one example of the different between using the real circuit and the simulation. In the real circuit you don’t need to include the F_CPU in the C code as the compiler will automatically insert it for you using “-DF_CPU=11059200UL” argument base on the frequency option setup on the AVR Studio IDE. I think you should post this issue on the Proteus ISIS user forum. I finally got it working in the simulator really by adding F_CPU (clock freq). I like to simulate before buying the actual hardware or development board, because in the simulator, you are not limited with hardware materials and cost. Then when you figure out that you got what you want, then its time to buy the hardwares and build the circuit. Thanks for your tutorial, you’re great and your code is really fantastic and very encouraging to learn embedded C in more depth. It helps a lot of experimenters like me. Thank you for your best and complete tutorial. I really appreciate taking your time to produce it. every line has description and this is wonderful. Would you please upload twi.h library for download? I found it,but thank you very much. please i need your support and guide on how to solve the problem of this DS32B35 RTC.i have programmed the RTC and it is working but the operation is not stable.it worked for only 3hours then stopped.i re-set it 3-4 times but the same thing happened,worked for about 3hours then stopped. i do not know if the problem is from the real time clock or from my code.i have tried to look for the likely cause of this hanging but unfortunately i could not figure it out. Sir,i will highly appreciate your further guide and support in this regard.below is the while loop i used to read the RTC and then display it on my Lcd. the above loop is not in my main program,it is in another function which is called by the main program.i do not know if this could have any effect on the operation of the clock.once again thank you for the usual support. Just curious, why you used 550ms twice (total more than 1 seconds) in your loop? Read the “The Real Time Clock (RTC) Chip” section in this project, you need to set the SQWE bit at DS1307 address 07H. Yes. But how do I set those at 07h RS1 and RS2. Still I can not send him good data. I tried this sequence, but still on my DS1307 output signal appeared. Do you know where I could make a mistake? Did you use a pullup resistor on the DS1307 open drain SWQ/OUT pin? Yes. I used 10k puillup resistors. Sorry. But I make a very big mistake. Sorry for that tedious question. Hi sir i am implementing RTC using DS1307. I just want to know that which function from RTC_read or RTC_Set should be called first. If i using SER_RTC And Read_RTC then which function should i call first. I am attaching my 2 functions.